Superheroes, nefarious villains, artists and the megafans who love them will all congregate in Hutchinson June 20-21. Is it a dastardly plot? An epic battle between good and evil? Blazes, no! It’s Kansas’ newest fun and whimsical event: Smallville ComicCon. A few years ago, three comic book fans noticed the similarities between the City of Hutchinson and Clark Kent’s fictional hometown of Smallville, Kansas. The three launched a grassroots campaign to recognize Hutchinson as the official Smallville. 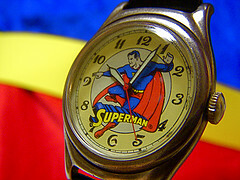 Their efforts caught the attention of long-time Superman fan Jon Robinson, who loaned some of his memorabilia to the effort. The movement eventually garnered the support of the city of Hutchison and the Kansas Hall of Fame, which inducted Superman as the most recognized “Kansan” in pop culture, coinciding with the Man of Steel’s 75th anniversary celebration. Plus many other stars of the comic, convention and costuming world. The second annual Smallville ComicCon will be Saturday, June 20, from 9 a.m. to 7 p.m., and Sunday, June 21, 2015, 10 a.m. to 5 p.m. in the Kansas State Fairgrounds’ Meadowlark Building. Advance tickets are available online. All other tickets will be available at the venue on the days of the event. Parking is free. For more event information or interviews, contact Jon Robinson at [email protected] or 620.897.7420.